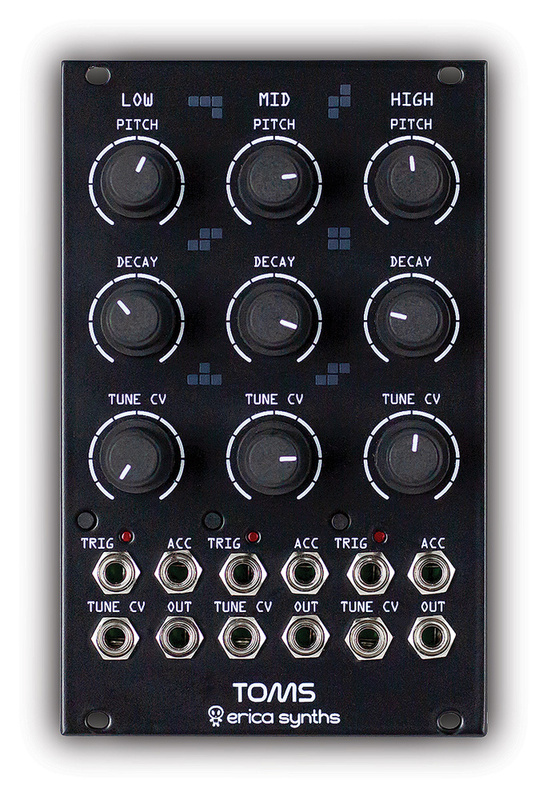 With their black knobs on black panels, these modules are neat and uniform, having hardly a distinguishing feature or spot of colour amongst them. Usefully, they all feature manual trigger buttons to audition any drum voice — even when a trigger lead is connected. To better pair up with the company’s Drum Sequencer, each trigger is accompanied by an accent input, which instructs the module to deliver a full-volume hit when +10V is received. In creating this ambitious system, Latvian Erica Synths have partnered up with French company e-licktronic to develop modules with a distinctly Japanese flavour. This should ensure a warm reception all around the globe — or across the plate, for you Flat-Earthers out there! I can’t think of a better place to start than the bass drum: the root of any kit and the voice that binds the others together. Squatting unashamedly at the TR-909 end of the spectrum, this module sports sufficient on-board tweakage to take you from round and floppy to hard and edgy. If driven by Erica’s Drum Sequencer, the accent input provides just two different levels. However — and in common with all the modules — more subtlety can be extracted from sequencers able to send discrete velocities over the full 10V range. Size: 14HP. Current: +12V = 40mA, -12V = 30mA.The main Pitch control sweeps up from a satisfying rumble to a high tap. Adjacent, the Tune knob is oddly-named since it sets the duration of pitch decay. The effect of this simple envelope is the province of Tune Depth — and with just this knobby trio you should have no trouble creating a workable range of thuds, donks and zaps. Next, the Attack control doesn’t vary the attack time; rather it increases the level of an initial transient — a hard edge to give your kick more bite, even when operating at its lowest pitches. At least the Decay knob is perfectly straightforward, although as we’re in modular territory, I could have used a much shorter minimum decay time. The maximum is around three seconds, though, which feels like plenty. Finally, Drive introduces overdrive to fatten up and fill out an already weighty kick. This is ideal for the harder end of the dance spectrum and handy to have built-in. 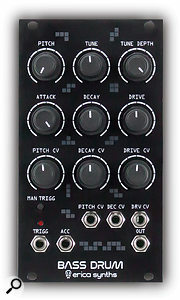 Both overdrive and accent have the effect of extending the decay time slightly. CV control is provided for the pitch, decay and drive, and this way you can obtain even deeper (or higher) kicks than from the knobs alone. However, even if you send negative voltages to the decay, it doesn’t make it significantly shorter. While this Bass Drum is clearly 909-like, it’s hard to argue with that as a design choice. Here it’s given just enough control to personalise it, without turning it into something else, adding extra animation via external control of one or more parameters. For anyone building a Eurorack drum kit with a traditional flavour, this would be a solid start. Size: 10HP. Current: +12V = 37mA, -12V = 35mA.The snare is another familiar voice and a worthy partner for the bass drum. Via the Snappy knob, you’re able to balance the drum head and noise components and when Snappy is turned right down, you can completely isolate the body of the drum. Oddly, going in the opposite direction doesn’t quite eliminate all the body and deliver pure noise. Cranking the Tune control to its maximum will tighten the body to almost-cowbell territory but it never quite gets to a convincing rimshot. Similarly, the body’s decay is a fixed value; the panel’s Decay knob affects only the noise component. At the shortest decay settings, you can get close to a Roland CR-78 snare, with longer decays suggesting Roland’s later models. Providing a wide sweep of the noise’s cutoff frequency, the Noise Tone knob is a significant part of the sonic armoury. Since it sounds so good, it seems sad that the module only offers CV control over decay and tuning but not this sweet filtering. Needless to say, Erica’s snare can emulate a selection of Roland snares rather well. Size: 16HP. Current: +12V = 83mA, -12V = 76mA.This is a triple module, with each voice having a separate output, with no on-board summing. Each features pitch and decay controls, enabling you to tune the low, mid and high toms to taste. In common with the other Erica drum modules, none of these can be pushed too far from their designated roles; the ranges for each parameter are quite limited. You can, though, apply external voltage to the pitch and negative values are handy for turning the low tom into a useable kick. The toms have a not unexpected TR-909 tonality and impact. If you have three spare mixer inputs and a liking for classic analogue percussion, these toms are suitably big and punchy. 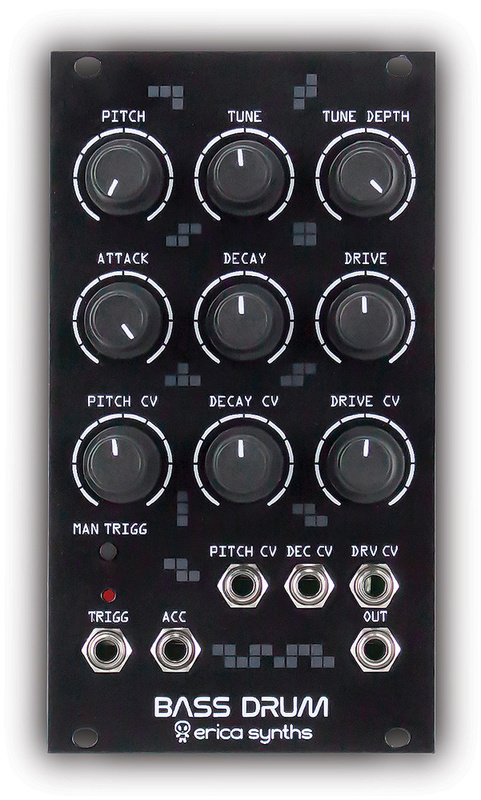 The Clap is one of the smaller modules in the range, offering knobs for master Tone and Decay, plus a voltage input for the Tone only. Tone moves smoothly from a low, barking plop to a high nasal tap, putting the most recognisable clap frequencies somewhere in the middle. Size: 10HP. Current: +12V = 24mA, -12V = 20mA.Decay doesn’t make a huge difference to the clap length; instead it adds a kind of low level release that does a decent job of impersonating room reverb. Although simple, this is a solid and useable percussion voice, its distinctive flam suggesting several hands not quite in perfect sync, like a group of old ladies at a Barry Manilow concert. I’m not totally convinced by the all-black look and uniform layout of these modules. Group several together and they become rather anonymous, at least if you’re used to grabbing knobs at speed. But if voltage control and modular integration trump simply buying a drum machine, there’s much to appreciate. Together, these drum modules deliver bread and butter drum voices that consistently serve up a palette comparable to classic Roland sounds. Given the online wails and shrieks that arise whenever a drum machine deviates too far from those, it could be a canny move. Bass Drum $250, Snare $225, Toms $360, Clap $155.